Wantagh, NY: Harry Park, a 46 year old jewelry maker from Flushing, NY, won $1,475 at LIGBT’s Super Bowl Marathon at AMF Wantagh. Harry won the $1,000 top prize in the handicap marathon by defeating Donald Eubanks, Elmsford, NY ($500) 242-235 in the final shootout. He also won $275 by finishing second in the scratch marathon and another $150 in handicap high game pot action. It was a great day for Harry! The handicap final shootout involved the top two 49 & under bowlers and the top two seniors. In addition to Harry Park, James Marino, Lindenhurst, NY also advanced from the 49 & under group. In addition to Donald Eubanks, Sun Kim, Flushing, NY advanced from the senior division. 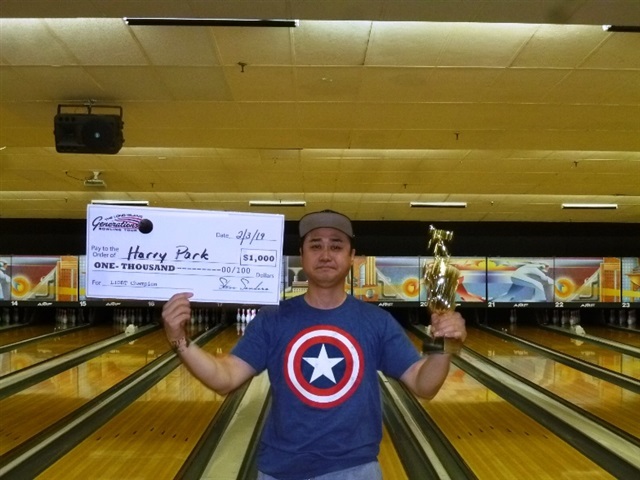 Harry took control of the shootout when he threw 4 strikes in a row starting in the 6th frame. Donald had the early lead but missing 2 ten pins cost him the title. Sun Kim had 4 splits and settled for third with a 203 worth $300. James could not carry a strike all game and finished 4th with a 202 earning him $250. The scratch event was dominated by Adam Chase, N. Babylon, NY as he shot a 1273 five game series. That’s an amazing 254 average which gave him a solid 94 pin victory over second place finisher Harry Park. Adam won $500 for winning the scratch tournament. The Super Bowl Marathon at AMF Wantagh drew a nice crowd of 93 entries (68 handicap and 24 scratch.) The handicap event paid out $3,170 to 14 cashers (1 in 5) and the scratch event paid out $1,175 to 5 cashers (also 1 in 5). The high game pots paid out another $750. To cash in the handicap event it took a 1230 in the 49 & under division and a 1223 in the senior division. To cash in the scratch event you had to shoot 1111 or higher. Redy Bugaoan won a Hammer Statement ball in the LIUSBC raffle. LIGBT’s next tournament is a house shot event at Farmingdale Lanes on Sunday, February 10th. Top prizes will pay; $1,000-$500-$300-$250 with 1 in 6 per age division advancing. To view the final results of the Super Bowl Marathon please visit www.ligbtour.com. The LIGBT is sponsored by Kegel, Knockout Ball Cleaner, Torch Bowling, Billvee Electric, & Vietri Associates, and ManyStylesOfBowling.com.